There is this unique bond between man and animal – and some of us have learned to domesticate these animals to have them end up as pets over the many thousands of years, where both dogs and cats happen to be among the most popular pets worldwide. Cats can be aloof at times, and noisy too, if they happen to be in heat, but there are times when you are simply unable to decipher what your feline companion is trying to “tell” you. Perhaps having an electronic tool might be able to help you out there – case in point, this $167 Meowlingual Cat Translation Device. Of course translating the human language is infinitely easier as opposed to figuring out what a cat is trying to tell you, but there are road bumps in achieving the former, too. How does the Meowlingual Cat Translation Device work then? It claims to be able to decode what your cat is telling you, through the analysis of the expression on your feline friend’s face, before it goes ahead to categorize it into half a dozen different moods. The gadget also touts to translate approximately 200 words in “cat chat”, by interpret 21 kinds of emotions that are based on your cats gestures and behavior, all the while offering 85 types of health checks. Of course, this is by no means an excuse for you not to bring your cat to the vet should it look unwell. 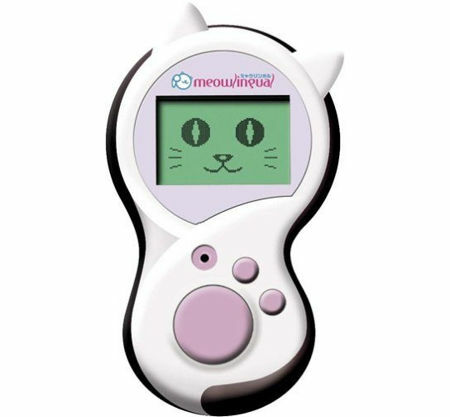 Powered by a couple of AA batteries, the Meowlingual Cat Translation Device will arrive in pink, black, and white colors. How do you know if it’s giving you the accurate answer. Have there been studies.